Taylor's Sweet Little Art and Nerd Site: Sketch Card of the Day- Snout Spout! Today's deviation is Snout Spout! Ok, so this guy has an elephant head. There are times I think that this type of mash up only works in the Masters of the Universe, um, universe. Ok, I know it only works in the MOTU world. As far as I know, there was not a lot of background story on this guy before the Classics version toy came out last year with a new biography for him. And I have to admit, I really like the bio. The quick idea is that this guy was kidnapped by the Horde and fitted with cybernetic parts. He was able to escape, and seeing what he was, took the name Snout Spout and used his mechanical trunk to shoot water. Interesting; do they have elephants on Eternia or Etheria? I don't know, but he became the elephant headed heroic master of firefighting! I had this guy in the vintage toy form when I was a kid. He was pretty cool. He came around towards the end of the line when a lot of fans feel that the Masters of the Universe was getting a little too weird (Not sure that is entirely possible). I really liked him. This guy is one of those characters that you think is cool, but can't bring yourself to get on your own. I never sought this action figure on my own. I thought he was silly. He was given to me by a friend and I never would have liked him if I didn't have him in my hands! I think his action feature mixed with his appearance mixed with actually holding him is what made him cool. Does that make any sense? 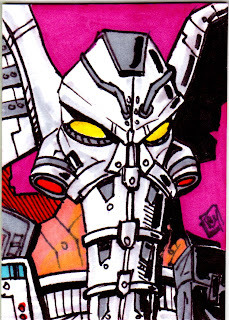 I'm still after a vintage version of this guy, and I am also after the NECA statction 200X design of him (this sketch card is based on that design), AND the Masters of the Universe Classics release of him too. Again, he seems silly, but because it's Masters of the Universe, I think he works! You can also see this sketch card here.